The hip flexors are a group of muscles that include the iliopsoas, as well as the rectus femoris. They work to bring the legs and trunk together, which helps you complete your ab exercises, lift your knees and bring your thighs toward your stomach. Since these movements are essential for running, it’s important to keep your hip flexors loose and limber. If you’re feeling tight around your hip area, the following stretches will improve your comfort and range of motion. Standing stretches are a basic yet effective way to unwind your hips and prevent injury. To complete the stretch, stand with your feet hip-width apart. Make sure your toes are facing forward. Next, bend your right knee, raising your right heel up toward your glutes. Take your right foot in your right hand, gently pulling it until your knee is pointed toward the floor. Hold for 30 seconds and then repeat on your left leg. Complete the actions two to three times on each side. If you’re having trouble balancing, hold onto a chair, counter or table. These stretches are easy enough to complete anywhere, including the gym, at home or the office. To complete seated hip stretches, sit diagonally on the edge of a bench or chair. Straighten your back, put both feet on the floor and keep your knees bent. Next, slide your right foot back and lower your knee to the point just before it reaches the ground. Make sure your right leg is bent at a 90-degree angle, so your knee is directly below your right hip. Take care to keep your feet on the floor. Once you’re in this position, tighten your glutes and hold them this way for 30 seconds. Do the same thing on the left side. Do the exercise on each side three times. When an athlete is supine, they are lying on their back and facing upward. To do this hip flexor stretch, you will lie on the floor with your legs straight and your toes pointing toward the ceiling. While keeping your right leg straight on the ground, bend your left knee so your foot sits flat. Interlace your fingers behind your left knee, inhale and pull your knee toward your chest. As you do this, be sure to keep your hips, back and right leg secured to the floor. Exhale and pull your left knee even closer. Hold the position for 30 seconds and then do the same thing on your right side. For best results, stretch both the left and ride sides three to five times. Now that you’ve loosened your hips in a range of positions, it’s time to kneel. Place your left knee on the floor and your right leg at a 90-degree angle in front of your body. Place your hands on your right knee. Keep your back as straight as possible. As your left knee stays pressed on the ground, gently lean your body forward into your right hip. Squeeze the muscles in your left buttocks for 30 seconds. Repeat the same process on the other side. Do this stretch two to three times. This stretch will feel excellent in your hip flexors, back and quads. Begin by standing with your feet together. Take a step forward with your left foot to achieve a staggered stance. Bend your left knee into a lunge. Keep your right leg straight behind you with your toes on the ground. When you achieve the right position, you will feel a stretch in the front portion of your right thigh. Now, place your right hand on the floor and carefully twist your upper body to the left side. Extend your left arm toward the ceiling. Don’t forget to breathe. Hold for 30 seconds and then repeat on the other side. Complete this stretch on both the left and right sides a total of four times. This stretch is effective and fun to do, but it’s important not to round your lower back. Focus on a tight core and a straight spine to protect your back muscles as much as possible. First, take a wide stance and point your toes outward. Squat until your thigh muscles are parallel with the floor. Place your hands on your knees to help stretch your hips and inner thighs. Keep your heels on the ground and distribute your weight evenly through the balls and heels of your feet. The butterfly is not only a classic stretch, but an excellent way to loosen the remainder of your hip area, cool down and relax your muscles. Sit on the floor and bring your feet in front of your body. Bend your knees out to the side. Sit up as straight as possible, keeping your core tight. Use gravity to push your knees to the ground while your hands stay on your feet or behind you. Hold for 30-60 seconds. Repeat two to three times for best results. Wearing compression gear during your stretch time can help relieve pain and increase blood and oxygen circulation throughout your hip flexors. Be sure to drink enough water before, during and after stretching to further encourage the delivery of oxygen and nutrients to your muscles. If you’re completing these activities just before or after you run, a running hydration belt is a useful piece of gear for drinking fluids during warm up and cool down. If you’re doing them at home or in the office, be sure to keep a water bottle close by. Once you try each stretch, completing a few of your favorites every time you feel tight will help you avoid pain and injury. You can also add a couple to your daily cool down routine to prevent tightness. 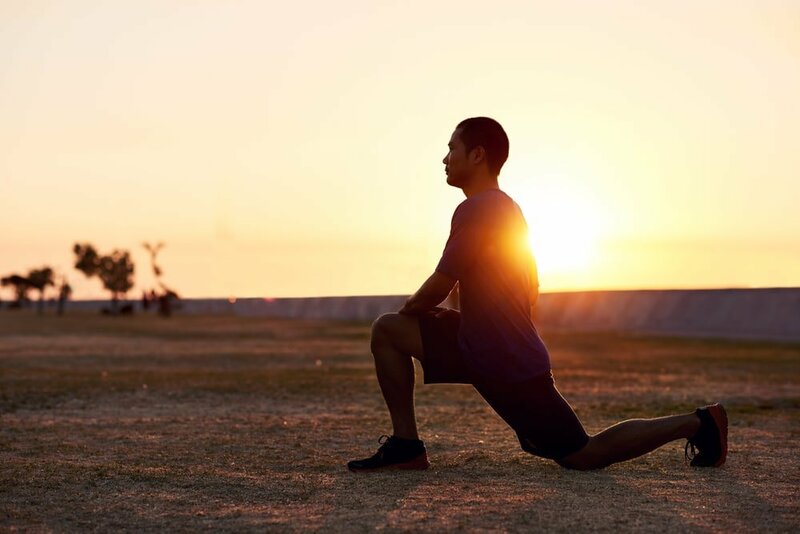 The stretches that work the best will vary for each athlete, especially according to their unique body and running style. What matters the most is that you’re comfortable and limber enough to keep training and make your best time.